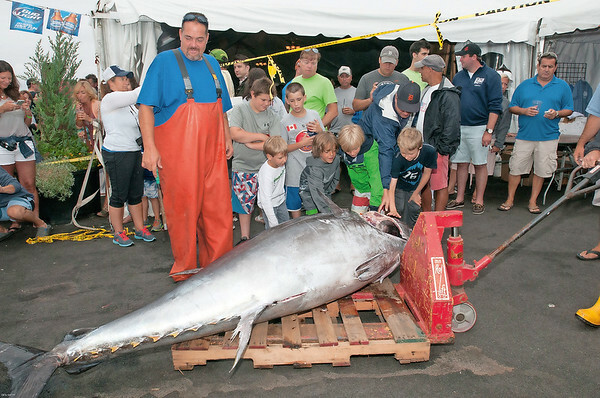 Weigh Master Ricky Schrafft, left, of Compass Seafood, looks over a 588-pound bluefin tuna as young children get to touch the biggest catch of the day, caught by Captain Anthony Caturano of the Tonno out of Gloucester, along with Captain Mark Kooskal and Dan Reddy, at last year's Bluefin Blowout Tuna Tournament at the Cape Ann Marina. This year's tourney runs at the marina from July 23 to 25. Tuna3rd Annual Bluefin Blowout Tuna Tournament.